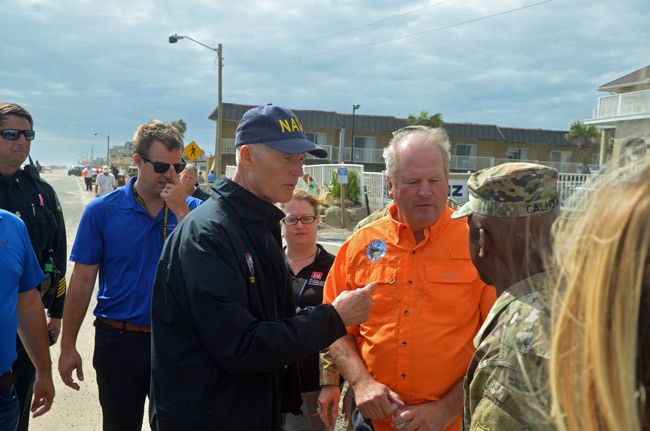 Today–10 days after visiting Flagler Beach and seeing the devastation of Hurricane Matthew there firesthand–Gov. Rick Scott ordered the Florida Department of Transportation to expedite the restoration of two-way traffic on A1A in the city, and have it opened again by early December–much faster than earlier estimates–according to a release posted on the governor’s website. The transportation department, in response, said restoring traffic there is now the Number 1 priority in the state. The transportation department, the governor’s office said, will immediately proceed with an emergency procurement that will result in the reopening of A1A no later than 45 days after contract execution. That’s quite a bit sooner than the timelines local officials projected just Wednesday, when they first spoke publicly of the plan afoot to reopen the road, in an emergency measure, within three to four months. The repairs considered at the moment will not be the permanent fix, but merely a reopening of the road as two lanes to ensure that traffic flow on A1A is restored, and to provide relief to businesses along A1A that have lost that traffic since the hurricane struck, demolishing a 1.4-mile stretch of road. About 3,000 feet of that stretch at the south end of the damage will actually be repaired within days. Traffic has been diverted to Central Avenue since the disaster, to the displeasure of residents there. The contract for restoration is expected to be executed over the weekend, and construction will begin early next week. Once the contract is in place, the contractor will have no longer than 45 days to restore north-south traffic flow to the impacted area of A1A. That measn the road could be open again by early December. The State of Florida and FDOT are responsible for reconstructing and reopening A1A, and all aspects and phases of the project will be managed and overseen by the agency. This will include installing temporary lanes on A1A in both northbound and southbound directions. Those will be 10-foot-wide lanes, as opposed to the usual 12 feet, and the speed limit will be lowered to 25 mph. The new lanes will shift A1A farther to the west, encroaching on right-of-way but not private property, with southbound traffic using newly constructed temporary pavement. The existing lane that did not sustain extensive damage will be made traffic-ready and will be utilized by northbound traffic. FDOT will also shorten the detour on the north and south sides of the impacted area, giving access to more businesses and homes, and lowering the number of vehicles using South Central Avenue as a thoroughfare. FDOT efforts to shorten the detours, as well as additional work on impacted areas to the north and south of the washed out section of A1A, are already underway. Hey Dave, bet you might feel a little differently if it was your business being affected. Closed, forever?! Not a good idea for tourists (who bring in a lot of money to the area as they drive up & down the coast) and to the residents alike, who I doubt would like the traffic going through their neighborhood! Mother Nature should be left alone but fixing it in this case is the right thing to do. Im not suggesting that portion be closed to pedestrians, business’s would still get plenty of foot traffic. It’s just time we closed the road, it’s obvious the sea levels are rising. A few peoples small buisness does not trump everyone’s natural sure shaping beach. Fantastic news! A1A is an absolutely necessity to expedite personnel for emergencies as well as being the main coastal thorofare. Me thinks Dave needs to realize that mother nature, the wind and sea are part of out ecosystem. I’m no geo-engineer, but I’d think that shoring up the shoreline would protect the fragile ecosystem, not destroy it. Bravo to the Florida officials. “it’s obvious the sea levels are rising” No Sir, it was a major hurricane hitting direct on a barrier island hit harder than recent memory. What is so “obvious” to you, any true evidence? Yes it is a absolute fact that the sea level has risin 2 or 3 inches, causing the storm surge to be even greater than in the past. So you ask if i have any true evidence? The answer is yes and you can feel free to check on the ocean level yourself thanks to global warming.